No small amount of pixels have been spent talking about social media and a stroll through the Networks or Communications categories on my own blog will expose much navel gazing. Nabil is continuing to think about these things which I found because Warren mentioned him, while adding some of his own sage advice. I’ve been doing more thinking and less acting on those thinkings recently and I’m still not entirely sure how I feel about the current state of things. If anything I’m more aware of nuance than I used to be, that is I’ve always been quite up front that my own perspective is just that and shouldn’t be applied to or against anyone else who certainly has their own perspective as well which is equally as valid or invalid as mine. The issue now is that I’ve got more than one use case personally and so what works for my left hand is sometimes more complicated for my right. People still talk about a blog post I made 7 years ago about why I stopped using Facebook which I still stand behind, for myself, but I also understand how that reasoning in a different context with different people doesn’t make as much sense. I used to think it was a privilege to use social media and I’m much more aware these days that in fact it’s a privilege not to. If your car breaks down in the middle of no where and after walking for miles you find a restaurant and go inside for a drink of water do you complain because they only have bottled water from the brand you dislike and no running water, do you throw the water back at them and keep walking? Or do you drink it so that you don’t die of thirst and then try to find a better option next time? I don’t know what I’m really saying there other than that I can make a weird analogy about anything. When I lived in Los Angeles if I wanted to see friends I had 100 different places I could go to in a few minutes to do that. If I wanted to talk to people they were all awake and online. If I wanted to see familiar people but didn’t know or care who they were, I had a list of places I could go and for sure would stumble into someone I hadn’t planned on seeing that day. Living in Tokyo is different. I don’t know as many people, the people I know are asleep when I’m awake and coordinating social anything is a struggle. How that translates into online usage is that I find myself missing people that I can only connect with on social media. I went back to using Instagram before leaving LA because I wanted to use it as a portfolio for my photography because that’s where people were looking. I’ve done that, but I’ve also connected to friends new and old and been invited to participate in projects I never would have otherwise. I have conflicting and mixed feelings about this. I walked away from Twitter for a while at the end of last year which I think was a good hard reset, but I find myself now realizing some of the value that I’m missing from it. I have private Slack teams and mailing lists, but there’s something different about the stream you get from the same people and the stream you get from the open world of the unexpected. I don’t know how I will continue to use these things, but it’s something I’m thinking about. I need to understand the balance between consuming and publishing, for myself. What is it that I want to say, and where & who do I want to say that to? And what do I want to read? I fired up an old RSS reader today too, but I have no subscriptions. I don’t know where to even find a list of my friends feeds anymore. I don’t know who to follow, who to mute, who to ignore. By all this I mean to say that for the last 19 years or so I’ve carried lists from one place to the next, with preset groups to follow and communicate with. I don’t have any of that now, and it’s like slowly wading into an ocean that I know I’ve been in before, but so long away I forget where the drop off is, so I’m being cautious. I really hate carrying anything so if I have to carry things, which I often do, I want to carry them in the most efficient and minimal way I can, and do that with some style. I used to always be hunting for “the perfect bag” thinking I could find something that would work for all occasions but I now know that simply doesn’t exist, and different problems require different solutions. Because of that, I obsess a bit about bags which is annoying for me, but perhaps beneficial for you. Build quality – Is it going to fall apart after using it every day for 6 months? Weather resistance – Is my stuff going to get ruined if it starts raining while I’m out? Usability – Do I need to think about how to get to my stuff, or is it intuitive? Lifetime guarantee – If there is a problem, will the company stand behind their product? Chrome Industries Cardiel Shank – If I need more than I can carry in my pockets, this is my go to. In the 80’s this would have been called a hipsack, a fannypack or any number of other pejoratives. While the style was questionable then the logic was sound, and in the decades sense the style has course corrected. I tend to wear this across one shoulder so I can swing it on to the front for easy access or to the back to disappear. It’s subtle, but large enough to hold my iPad Mini, field notes and/or a moleskine notebook, a Leica M body or other compact camera, a bag of coffee, some extra film or even a compressed micro-puff jacket, should I anticipate needing such a thing. This is too small for a laptop, but that’s exactly why I like it. A Chrome Industries messenger bag was my daily carry for much of the early 2000’s and their products have always been bombproof. Mission Workshop Spar – If I need to a laptop but not much else, I reach for the Spar. This is basically a laptop sleeve with a tiny extra pocket for cables, and several ways to get into the main compartment. This is so thin it will fit unnoticed under a jacket if that is required, and the sling strap adjusts incredibly well. 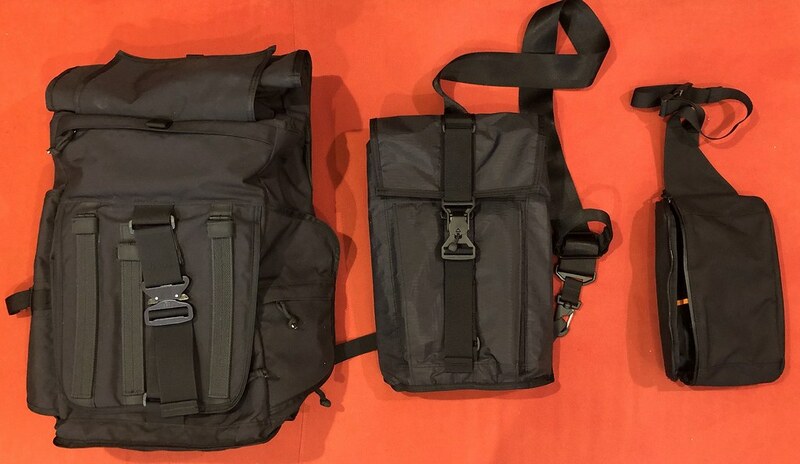 I moved away mostly from one-shoulder kind of bags because I find they hurt my back after carrying them all day, so I bought the add on backpack harness, but I actually find the one shoulder strap to be more comfortable. Mission Workshop Integer – I actually bought the previous version of this called the Rhake the moment it was released and loved it in every possible way. My only complaint was that if I put my camera into it, I didn’t tend to take it out because there was just too many steps involved. That only matters because of the kind of photography I do, where I need my camera quickly and also want it out of the way just as quick. When they announced the Integer, which seemed like the Rhake with an additional side opening to quickly grab a camera I was all over it. In practice the Integer is actually a bit larger than the Rhake. While the Rhake has a very slim profile, the Integer sticks out from your back a bit more which can be an issue in crowds or when trying to jam it under a plane seat, but pulling out the built in foam padding that makes up the camera compartment helps with that a bit but I do find myself wishing it was a bit flatter. Original Rimowa Cabin – The above covers 90% of my “carrying stuff” needs, but I’d be remiss not to discuss travel as I’ve done in the past. The Integer is actually large enough to hold what I need for several days, but if I have extra gear or am going around the world for more than 5 or 6 days then I’m bringing a suitcase and there is nothing better than Rimowa. I’ve discussed this before but I used to go through $150-200 bags every year, they’d drop a wheel, have a zipper failure, or something else which added unexpected and sometimes nightmarish issues to my trip. I kept hearing about Rimowa and eventually caved in and threw down the big bucks for one and it’s the best suitcase I’ve ever had. More than a decade later it still looks and works like brand new, and I never worry about it breaking mid trip. I few years back I was gifted the aluminum version of the composite model that I had, and immediately passed the composite one down to my son who I’m certain could use it for the rest of his life without ever needing to replace it. The pricetag seems high, but with a literal lifetime lifespan, it very quickly becomes cheaper than buying a new bag every few years. For anyone with a regular travel schedule, you’d be crazy not get one. Inside I use a set of Eagle Creek packing bags to compress and keep laundry and toiletries separate, and those work just as well in any of the other bags if I use them instead. That’s what I’m carrying when I want to carry stuff. Hope this was helpful and useful, let me know if further travel/carry/gear kind of posts are interesting for you and I’ll see what I can whip together.